استفاده از کامپوزیت های تقویت شده با منسوجات امروزه در صنایع مختلفی نظیر صنایع اتومبیل سازی، عمرانی، هوافضا و نظامی استفاده می شود. از جمله این کامپوزیت ها می توان به کامپوزیت های تاری و پودی اشاره کرد. در تحقیق حاضر رفتار کششی کامپوزیت تقویت شده با پارچه ی تاری و پودی کربن و کولار به روش اجزا محدود مورد بررسی قرار گرفته است. طرح بافت پارچه مورد بررسی سرژه 2×2 می باشد. در ابتدا یک سلول واحد کامپوزیت در ابعاد مزو در نرم افزار TexGen طراحی شد. سپس مدل طراحی شده به نرم افزار آباکوس جهت تحلیل اجزا محدود فراخوانی شد. پس از تحلیل مدل در ابعاد مزو با استفاده از کد پایتون نوشته شده ضرایب مکانیکی کامپوزیت استخراج شد. خواص مکانیکی استخراج شده به مدل طراحی شده در ابعاد ماکرو نسبت داده شد. سپس آزمون کشش بر روی مدل ماکرو انجام گرفته و خواص کششی حاصل از مدل با نتایج آزمایشگاهی مقایسه شد. نتایج نشان می داد خواص کششی کامپوزیت انطباق مناسبی با نتایج مدل سازی دارد. از این رو می توان با استفاده از مدل مزو خواص مکانیکی کامپوزیت را استخراج کرده و سپس آزمون مورد نظر بر روی مدل ماکرو صورت گیرد. استفاده از روش چند مقیاسی سبب می شود علاوه بر افزایش دقت در پیش بینی خواص مکانیکی کامپوزیت، حجم محاسبات نیز کاهش یابد. 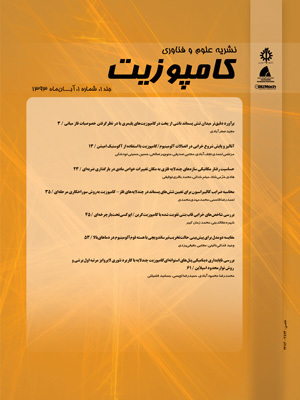 3Department of Textile Engineering, Isfahan University of Technology, Isfahan Iran. Nowadays, composites are being widely used in automotive, aerospace and military industrials. Woven composites are considered as a one of textile composites. In present study, tensile behavior of carbon and Kevlar woven composites was investigated by finite element method. Weave pattern of woven fabric was twill 2×2. In the first step, a unit-cell of composite was created in TexGen software in meso scale. After that, unit-cell was imported in ABAQUS software to finite element (FE) analysis. After FE analysis, a python code was applied in meso model to calculate mechanical coefficient of composite. The mechanical coefficients of composite were assigned in macro model. Then tensile test was done on macro model and results of FE analysis were compared with experiment results. The results showed that, tensile properties of model propose good agreement with experimental results. Therefore, meso model can be used to calculate mechanical properties of composite. Using multiscale method also leads to increase precision and solving reduction. Bilisik, K., “Multiaxis 3d Weaving: Comparison of Developed Two Weaving Methods (Tube-Rapier Weaving Versus Tube-Carrier Weaving) and Effects of Bias Yarn Path to the Preform Properties“ Fibers and Polymers, Vol. 11, No. 1, pp. 104-114, 2010. Hufenbach, W., Böhm, R., Kroll, L. and Langkamp, A., “Theoretical and Experimental Investigation of Anisotropic Damage in Textile-Reinforced Composite Structures“ Mechanics of Composite Materials, Vol. 40, No. 6, pp. 519-532, 2004. Mouritz, A., Bannister, M., Falzon, P. and Leong, K., “Review of Applications for Advanced Three-Dimensional Fibre Textile Composites“ Composites Part A: applied science and manufacturing, Vol. 30, No. 12, pp. 1445-1461, 1999. Dixit, A. and Mali, H. S., “Modeling Techniques for Predicting the Mechanical Properties of Woven-Fabric Textile Composites: A Review“ Mechanics of composite Materials, Vol. 49, No. 1, pp. 1-20, 2013. Crookston, J., Long, A. and Jones, I., “A Summary Review of Mechanical Properties Prediction Methods for Textile Reinforced Polymer Composites“ Proceedings of the Institution of Mechanical Engineers, Part L: Journal of Materials: Design and Applications, Vol. 219, No. 2, pp. 91-109, 2005. Anzelotti, G., Nicoletto, G. and Riva, E., “Mesomechanic Strain Analysis of Twill-Weave Composite Lamina under Unidirectional in-Plane Tension“ Composites Part A: Applied Science and Manufacturing, Vol. 39, No. 8, pp. 1294-1301, 2008. EBRAHIMNEZHAD, K. H., ESLAMI, F. R., KHORSAND, H. and ABBAS, B. K., “Hybridization Effect of Fibers Reinforcement on Tensile Properties of Epoxy Composites“ Journal of Science and Technology of Composite, Vol. 1, No. 1, pp. 21-28, 2015. Naik, N. and Ganesh, V., “Prediction of on-Axes Elastic Properties of Plain Weave Fabric Composites“ Composites Science and Technology, Vol. 45, No. 2, pp. 135-152, 1992. Ng, S.-P., Tse, P.-C. and Lau, K.-J., “Numerical and Experimental Determination of in-Plane Elastic Properties of 2/2 Twill Weave Fabric Composites“ Composites Part B: Engineering, Vol. 29, No. 6, pp. 735-744, 1998. Sherburn, M., “Geometric and Mechanical Modelling of Textiles“ Thesis, University of Nottingham, 2007. Nilakantan, G., Wetzel, E. D., Bogetti, T. A. and Gillespie, J. W., “A Deterministic Finite Element Analysis of the Effects of Projectile Characteristics on the Impact Response of Fully Clamped Flexible Woven Fabrics“ Composite Structures, Vol. 95, pp. 191-201, 2013. Dixit, A., Misra, R. and Mali, H., “Finite Element Analysis of Quasi‐Static Indentation of Woven Fabric Textile Composites Using Different Nose Shape Indenters“ Materialwissenschaft und Werkstofftechnik, Vol. 46, No. 10, pp. 1014-1028, 2015. Dixit, A., Mali, H. S. and Misra, R., “Unit Cell Model of Woven Fabric Textile Composite for Multiscale Analysis“ Procedia Engineering, Vol. 68, pp. 352-358, 2013. Li, S. and Wongsto, A., “Unit Cells for Micromechanical Analyses of Particle-Reinforced Composites“ Mechanics of materials, Vol. 36, No. 7, pp. 543-572, 2004. Sharma, R., Mahajan, P. and Mittal, R. K., “Elastic Modulus of 3d Carbon/Carbon Composite Using Image-Based Finite Element Simulations and Experiments“ Composite Structures, Vol. 98, pp. 69-78, 2013. Lin, H., Brown, L. P. and Long, A. C., “Modelling and Simulating Textile Structures Using Texgen“ in Proceeding of Trans Tech Publ, pp. 44-47. Sockalingam, S., Gillespie, J. W. and Keefe, M., “On the Transverse Compression Response of Kevlar Km2 Using Fiber-Level Finite Element Model“ International Journal of Solids and Structures, Vol. 51, No. 13, pp. 2504-2517, 2014/06/15/, 2014. Ansar, M., Xinwei, W. and Chouwei, Z., “Modeling Strategies of 3d Woven Composites: A Review“ Composite structures, Vol. 93, No. 8, pp. 1947-1963, 2011. Green, S. D., Matveev, M. Y., Long, A. C., Ivanov, D. and Hallett, S. R., “Mechanical Modelling of 3d Woven Composites Considering Realistic Unit Cell Geometry“ Composite Structures, Vol. 118, pp. 284-293, 2014/12/01/, 2014. Tsukrov, I., Bayraktar, H., Giovinazzo, M., Goering, J., Gross, T., Fruscello, M. and Martinsson, L., “Finite Element Modeling to Predict Cure-Induced Microcracking in Three-Dimensional Woven Composites“ International journal of fracture, Vol. 172, No. 2, pp. 209-216, 2011. Zeng, X., Brown, L. P., Endruweit, A., Matveev, M. and Long, A. C., “Geometrical Modelling of 3d Woven Reinforcements for Polymer Composites: Prediction of Fabric Permeability and Composite Mechanical Properties“ Composites Part A: Applied Science and Manufacturing, Vol. 56, pp. 150-160, 2014/01/01/, 2014.